Have you seen my facebook page lately? I’ve got some nice teasers of a big Valentine’s post that’s coming up! Now there’s a recipe I think of when I find cabbages the size of my head at the store–Unrolled Cabbage Casserole. This recipe was recommended to me by Leah over at The Content Owl. I was a little nervous at first about cabbage being such a central part of my recipe, though she had gotten it from the Health Bent blog that I had already had some success from (see last big Food Lover’s Friday Chipotle Meatballs). This recipe had a long cook time for a weeknight meal but it was much easier to build than my usual lasagna. The flavors were lovely (can’t have enough smoked paprika in my kitchen!) and the leftovers held together really nicely. I do want to note that you will want fairly larger servings than you’re used to with meat lasagna! 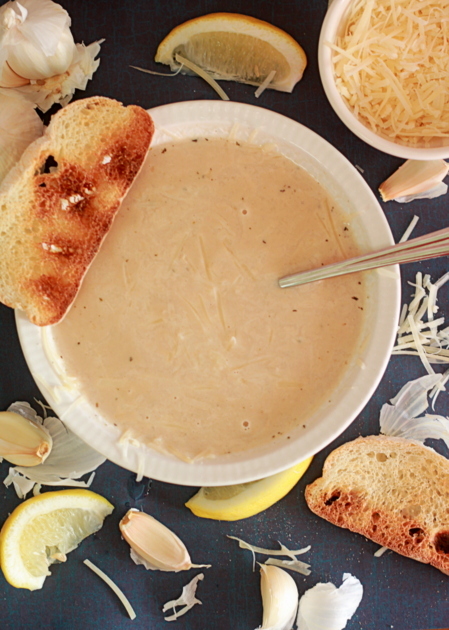 This has to be my favorite cream based soup we have ever made. I was really excited when I stumbled across this recipe (thanks to Simple Awesome Cooking). The Kitchen Treaty seems to be all about testing and retesting her recipes and I love knowing that my recipe was worked on until it was literally at perfection. Although a bit labor intensive, this meal is very rich and flavorful. The leftovers also stand on their own perfectly well, and you could make this a full meal with some sourdough on the side or even a nice caesar salad. I’m very thankful that this week was full of successes! Make sure to check out and follow my Instagram for pictures of my attempts at Pinterest recipes BEFORE I post about them on Food Lover’s Friday! Follow The Spicy Bee’s board OMnomNOM on Pinterest. Fairly larger servings? Oh man – that means that in order for me to have some I would probably have to make one just for myself! hahaa…but true. Thank you so much for the shout-out for my 40 cloves of garlic soup, and for sharing that cabbage casserole as well … so intrigued! Mmm – I don’t usually cook with cabbage either but that looks delicious!